Hot Wheels (TM) is handcrafted and dated 1998 - An Unofficial Series - Sculpted by Ken Crow. QX6436. Born in 1968, HOT WHEELS (TM) cars were an immediate hit. Children and adults gleefully "mashed and crashed" the care in racing action sets that included "miles" of orange track, 360 degree loops, jumps, and curves. Today, the original "fastest metal cars in the world" have become treasured collectibles. 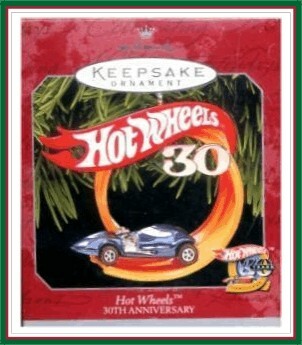 This Hallmark Keepsake Ornament commemorates the 30th Anniversary of HOT WHEELS cars. It features the popular Silhouette 6209, one of 16 custom classics introduced in 1968. The Silhouette was offered from 1968 to 1971. MIB with normal box aging. Has Price Tag.